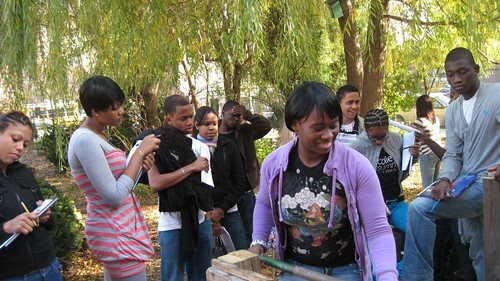 Six 12th grade Science classes from the International High School across the street from Brook Park were able to benefit from the composting expertise of the “Urban Transformers”. Students learning about compost, using a pitchfork to turn the decomposing pile. Click HERE for the lesson plan of the day. Replacing landfill disposal with composting is one of the easiest and most effective ways for New Yorkers to fight global warming. New York City has numerous inspiring green initiatives; however, eliminating organic matter being hauled to landfill is not one of them. As it stands now, composting is not widely available to New York City residents. Urban Transformers is working to change this. Through designing and implementing composting programs, education and community organizing, we will expand on-site composting in our parks, community gardens and throughout the City. Urban Transformers is a special project with Friends of Brook Park. You can reach them at urbantransformers [at] gmail [dot] com.